Special Theme: Regional Economic Integration in Africa: Part II. Thème spécial: L’Intégration Régionale Économique en Afrique, 2ème Partie. African Integration Schemes: A case Study of the SADC-; M. Ndulo. Trade Liberalization Under ECOWAS; E.K. Kessie. The Treaty For the Establishment of the New East African Community: An Overview; W. Kaahwa. 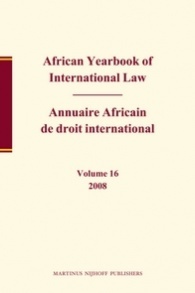 The Role of International Law in the Colonization of Africa: A Review in Light of Recent Calls for Re-colonization; D.C.J. Dakas. La protection constitutionelle des minorités en Afrique; V. Zakane. La clause des droits de l’homme dans un Accord de Coopération économique étude contextuelle de l’article 5 de la convention de Lomé; P.C. Ulimubenshi. The Realisation of Human Rights Through Sub-regional Institutions; F. Viljoen. The 51st Session of the UN International Law Commission; J. Kateka. Constitutionalism, Culture and Tradition: African Experiences in the incorporation of Treaties into Domestic Law; A.O. Adede. The Trial of the Lockerbie Suspects in the Netherlands; C. Morgan. Le mécanisme de règlement des différends dans le cadre de l’Organisation pour l’Interdiction des Armes Chimiques; S. Pounjine. The United Nations and Internal/International Conflicts in Africa: A Documentary survey; M. Sinjela. Treaty for the Establishment of the East African Community/Traité Instituant la Communauté de l’Afrique Orientale.